This was my first time to “play” with almond flour. Wow, is it awesome to work with! I had ordered a package from Vitacost to experiement with. It is not an inexpensive ingredient by any means. But I know that using alternative flours occasionally to give my family variety is a healthy choice. Plus, I’d heard that almond flour is awesome. It is so true! These simple muffins went together quickly, and the end result was amazing! 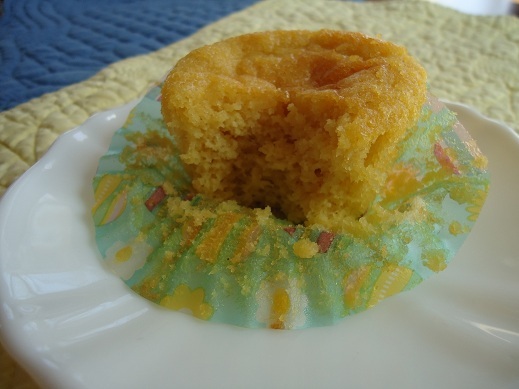 The muffins taste like a cupcake – super light, sweet, and airy. You can make your own almond flour if you prefer. Simply grind almonds in your food processor until a fine flour has formed. Just be sure you don’t grind them too long, or you’ll end up with almond butter! Mix together almond flour, baking powder, and sea salt. Add eggs, melted butter, honey, water, and vanilla and whisk until smooth. Spoon batter into 12-15 paper-lined muffin cups. Bake in a 350° oven for about 20 minutes or until muffins are golden brown. Have you done much baking with almond flour? What are your favorite recipes using this fun ingredient? This was a good post (without getting too technical) on possible negatives of almond flour. Bottom line – ‘everything in moderation’. I actually used almond flour tonight in my meatloaf recipe in lieu of breadcrumbs! I decided to change up my grandma’s old meatloaf recipe for a healthier, non-grain option and it is out of this world good! I have used almond flour in cookie recipe’s as well ( mainly the “paleo” version). I also make a “fried” avocado and toss my cubed avocados in seasoned almond flour ( I use garlic powder, salt & pepper for seasoning) to coat and then cook them on the stovetop with coconut oil or olive oil for a snack alternative….and honey mustard for dipping sauce! It really is so yummy! Almond flour is one we haven’t dabbled in much as of yet. Coconut pancakes are really good…and my entire family enjoys them. Nourished Kitchen has a lovely recipe. We love almond flour! If you have a trader joes nearby, they regularly carry it for 3.99 a lb. Cheapest price I have found anywhere! Eating waffles made with it right now! They are pretty good. I used half almond and half wheat flour. and the family likes them! We’re trying to ‘play’ with more coconut flour recipes, too. Yum! I made these for breakfast this morning. My picky almost three year old ate two of them! We’ve been trying to eat fewer grains so these are perfect at our house. How do you think they will freeze? I’m going to try with a couple of the leftovers. We use almond flour to make zucchini tots (mix with eggs, parm and seasoning to taste). We also use it in a recipe for grain free “Pizza Hut” breadsticks that taste really close to the real thing. I just ordered 5 pounds of almond flour from Azure and it was very economical. I have froze muffins and cookies that were made with almond flour and coconut flour. It worked fine. I think it is coconut flour you are not supposed to put baked goods in the fridge. They get hard. I have made cookies and muffins with almond flour. I also made a multi grain cracker and they were great. It was a recipe from Elana’s Pantry. I love using almond flour. I follow the Rosedale diet plan mostly. It is a moderate carb plan that is similar to Paleo in what I have read. Dr. Rosedale developed the plan from helping diabetics who were having issues with their blood sugar and he also was involved in leptin research. He has a great muffin recipe at the following location. You can also but almond flour and coconut flour at Honeyville grains. I am thinking about buying it in bulk from them. I heard it was cheaper…. I just turned on my oven to bake something with almond flour and thought I would quick check my email while it’s preheating and there was your almond flour recipe! So, that’s what I’ll be baking. elanaspantry.com Elana has a great chocolate chip cookie recipe and it is so easy to make. She recommends the blanched almond flour from Honeyville Grains because it is more finely ground than the almond flour or meal that you can find elsewhere. 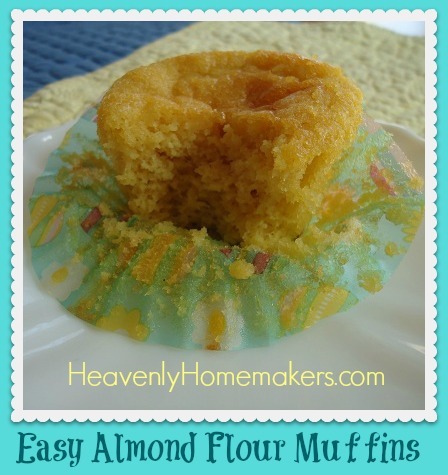 It is the most economical way to by almond flour that I have found. Honeyville frequently has sales and if you are on their email list they notify you. Their shipping is a flat rate of $4.49. You can actually make your own almond flour very easily, and I’ve found it to be quite a bit cheaper (at least where I live). You can try google for a ‘recipe’, but all you need to do is grind up raw almonds in a food processor. I buy raw almonds in bulk, and then I have them on hand to grind into flour, make almond butter, or to make almond milk. All three of these things are very easy to make, and all I need to do is buy raw almonds, which is cheaper, instead of several different products. on the mommypotamus blog she has a chocolate “donut” recipe that comes from the Nourished Kitchen’s baking cookbook. we made them as cupcakes and they are absolutely delish! (understatement). also, the comfy belly blog has a good recipe for banana bread using almond flour that is super tasty, too. (i add nutmeg to it). amazon is usually cheaper to buy the honeyville flour and with free shipping, too. Being a newly diagnosed diabetic, this recipe looked like it would be good one for me to enjoy with my morning coffee. Low carbs. I am out to find things I can eat, but it is a slow process. Since going gluten-free (for my girls) and grain-free (for me), we’ve done quite a bit of cooking with almond flour. I generally make my own by chopping it up like you said, but my food processor is quite old so it stays a little chunky…but I kind of like it that way! The girls love almond flour pancakes (and I hope to post the recipe soon), and I make some yummy pumpkin chocolate chip muffins with an almond flour & coconut flour mixture! It definitely it not inexpensive, but since I consider those kind of things “treats” that we don’t make very often, it isn’t too bad! Just made some pancakes out of this receipe…yummy. They held together good for flipping too! Still looking for the “perfect” gluten free pancake receipe. Since we are on the SCD diet, almond flour is pretty much all we use! It has greatly helped my son, who has IBS. Nuts.com has the best deal and I love how fine their almond flour is. Pecanbread.com has quite a few recipes for almond flour etc. My favorite recipe with almond flour is Blueberry muffins from the book “Breaking the Vicious Cycle”. Try adding about 3 tablespoons cocoa and just a little bit more butter. Laura, I just wanted to tell you “thank you” and give you a BIG HUG because I love having this recipe! Within about the first four or five days you posted it, I made 3 batches. But I have to say that I love it because it is versatile! The first batch I used flax in place of butter to make dairy free, and I added a couple shakes of cinnamon. Yummy! I keep trying new things and it works :) Like instead of the honey, I used 1/4 cup of maple syrup. And I added bananas to make Almond banana muffins. All seem to work great. I’m going to make some right now to go with dinner. Thanks! I am planning on making these for a birthday party but the birthday girl can’t eat or drink any dairy products and I was wondering if I could substitute the butter for almond butter? Thank you so much for all you do! I appreciate that you use your gifts and talents to serve other people. I was scrolling through your recipes recently and I noticed there was an advertisement at the very bottom of the page from ABC for the show ‘Betrayal’. I don’t blog so I don’t know how all the advertising works. It was at the very bottom of the page, so I just did not know if you were even aware of it. Just wanted to let you know. Loved this recipe! We’re trying to eat more healthy in this house. I bake a lot, so having al alternative other than white processed flour makes me happy! Thanks and I have now subscribed to your site because I want more! My boss just told us he is diabetic, and I being the baking queen asked him about honey. He said he can’t even have that. Then, I had made my mother in law almond bread sweetened w honey and after, she tested her blood sugar level n it was through the roof. has anyone tried this recipe using stevia or splenda or anything? In just baked these and they are delicious!!! Do they need to be refrigerated or will they keep on the counter in a Tupperware container? Thanks!! I made these muffins last night. Pretty tasty.